Organizing a bedroom can be a big challenge financially! Sometimes we are left with custom bedroom interiors in the home for which we all require the custom bedroom furniture which is sometimes becomes impossible to buy as all manufactured versions come in standard dimensions! What to do if are facing this kind of challenges? 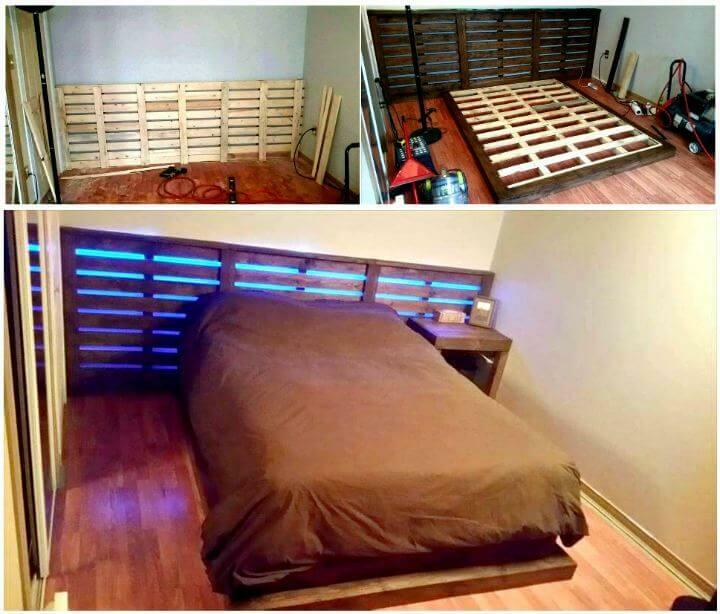 Go with DIY projects and build your own custom bedroom furniture in all required dimensions, this DIY platform pallet bed with lights and XL headboard is a better project here to copy if you want to organize a custom bedroom interior! Here pallets have only been dismantled to install the inside body of the bed and pallet planks have been filled in geometrical arrangements to do so! To get an all fancy background, the pallet board have been put vertical against the wall making an XL headboard, blue LEDs have been installed for a fancy light spread at night! 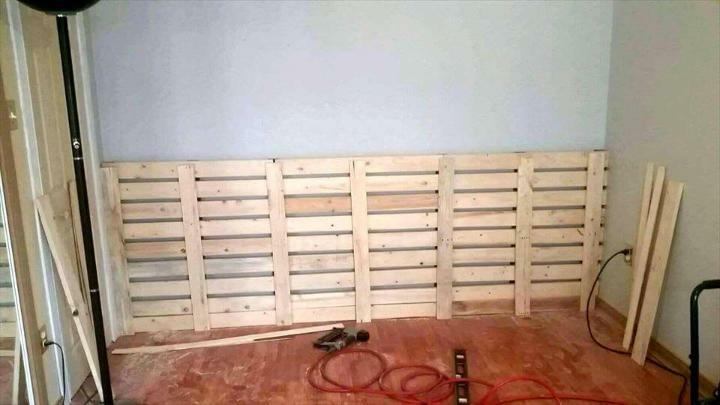 Make the pallet stained to avoid early signs of wear and tear and also install a nightstand using a remaining supply of pallets, a complete bed set, get at a zero cost price! This bedroom interior has opted for a large headboard inside and pallet-made units have been put together to fill the whole back wall of the bedroom for an XL size of the headboard! 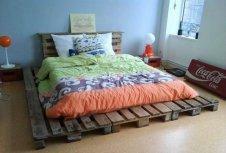 Pack the pallet flat to gain beefy wooden pillars or lengths that will make the borders of entire platform bed! For installation of the mid-side section, the pallet lengths have been brought to simple slatted arrangements! 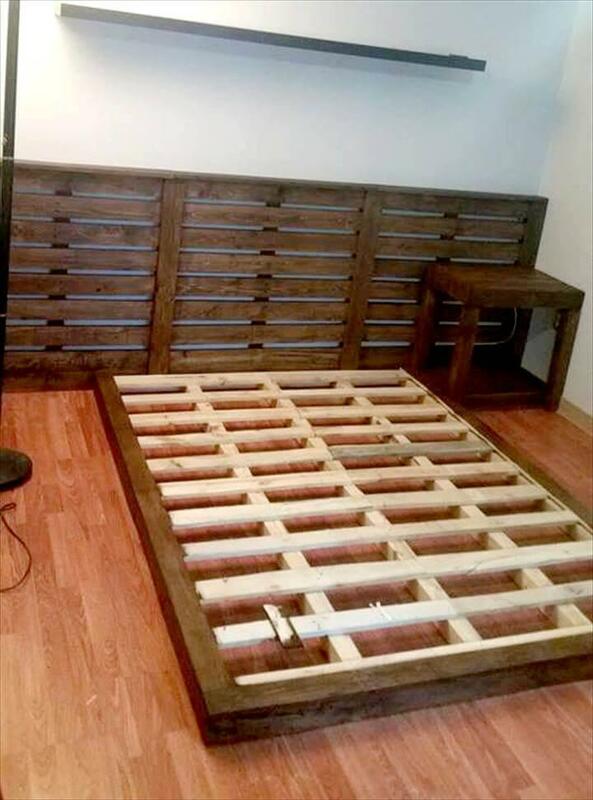 Make the filling of pallet slats neat and just enjoy this ever lowest-cost platform bed for your custom bedroom interior! 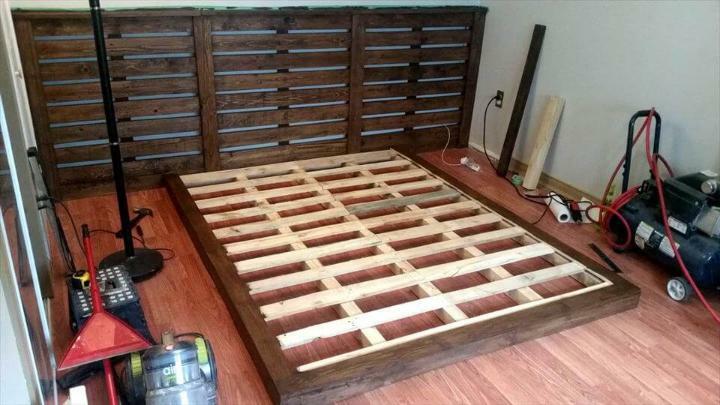 Do plan a durable finish for this entire bed frame, using stain coats with some popular wooden sealant would give it a rocking finish! 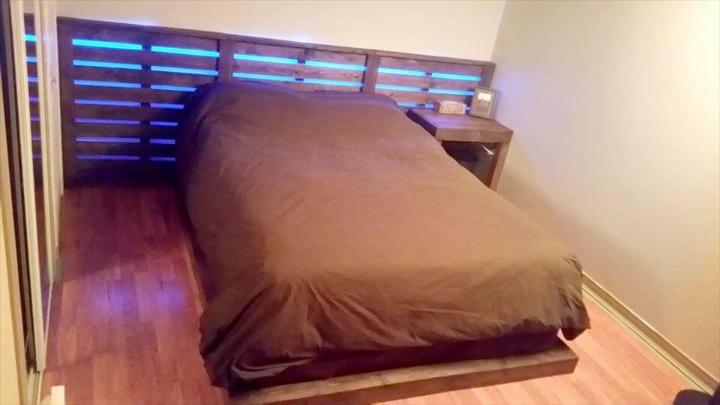 There are blue LEDs put in the back of the headboard and hence this entire bed gains a charming blue background at night, you can also plan multiple decors more to fancy up this handmade pallet platform bed!